At some point, annoying pranksters will come across the wrong people and get what’s coming for them. 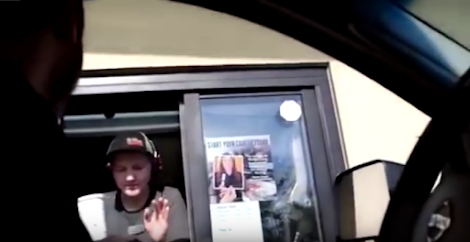 Two idiots were given the soaking wet Coke treatment after pranking a female McDonald’s employee working the drive-thru window. As they approached the window with the camera rolling, the driver honked his car horn to deliberately scare her while she was about to hand them the drink. This prompted her to toss the drink towards them in an act of retaliation. And when the driver tried to throw the drink back, she managed to shut the window in time. The video has sparked a debate among netizens due to the fact that she shouldn’t have exhibited such behavior to customers. However, some say the idiots deserved it. Thoughts?